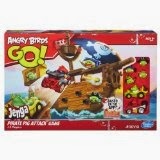 I'm happy to announce Katie Rose is the winner in my Angry Birds Go! Jenga Pirate Pig Attack Game! (you'll find the review at this link) Thank you Katie Rose for reading grandma's cookie jar (please message me your address by tomorrow, noon (Eastern Time - 12-17-13) so I can have it sent to you and thank you Hasbro Games for sending one for me to review and making another available for me to give away!